Laura would love to hear from you. Andrew Carnegie believed that hard work, education, and optimism could help anyone succeed. He started work at the age of twelve in a factory earning $1.20 a week. He ended up becoming the richest man in the world. He also wrote eight books! How did he do it? 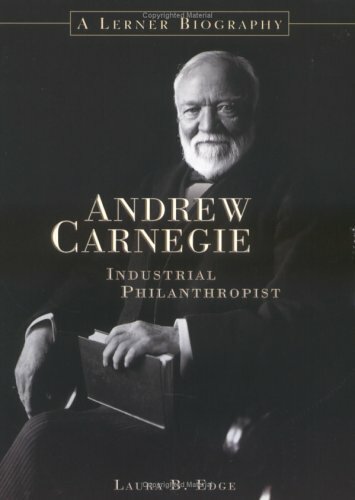 Carnegie felt that he should give his money away to help others before he died. Learn the amazing story of the man who made, then gave away, more than 350 million dollars. Laura B. Edge writes picture books, middle grade, and young adult fiction and nonfiction. She loves all kinds of books—historical, contemporary, books that make her laugh, and books that make her cry. She enjoys research and uses her love of history to create books that bring the past to life. An experienced reading and writing teacher, Laura enjoys talking to children and young adults about books and writing. She is an active member of the Society of Children's Book Writers and Illustrators and a team leader for the Women’s Storybook Project of Texas. You can find all her other releases on the Books page.